The sociologist of religion Peter Berger is known for his 1967 book The Sacred Canopy. I was thinking about it Friday night as I lay in the snow just outside the Eagles Nest Wilderness, as the Jet Stream ripped across the Gore Range. 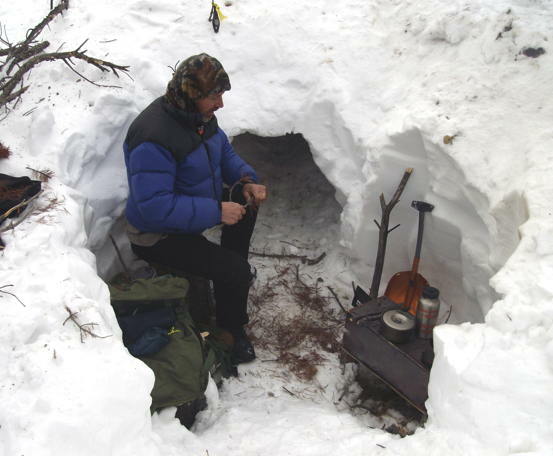 Berger writes, "The sheltering quality of social order becomes especially evident if one looks at the marginal situations in the life of the individual, that is, at situations in which he is driven close to or beyond the boundaries of the order that determines his routine, everyday existence"
Such as winter camping, for example — definitely not part of my everyday existence. What we want more than anything else, according to this sociological view, is to be in balance--to have a permanent stable order in our lives, so that we can predict both the environment and the responses to it that we and others around us will choose. Society's main project is to create this sense of stable predictable order and to make all of us believe in it, although in fact it is always a false illusion. We want a stable order, yes, which means that the tent stays up. But in one sudden 60 mph-or-higher blast, the high-tech "16-man" cooking/dining tipi, centerpiece of the annual Colorado Kifaru Winter Rendezvous, has simply vanished — and I lay in my sleeping bag, looking up at an angry murky sky, semi-illuminated by the Moon. The canopy, sacred or otherwise, was gone. Stability was a false illusion. Up, out of the sleeping bag, pulling on my boots, I made sure that the fabric had not snagged on the wood-burning stove — now tipped on its side — that still held a few embers. Plan A, check with Kevin, my near neighbor, who had an "8-man" tipi set up. I turned that way and—where was the tipi? It was down too, and its stove had tumbled a pot of melting snow onto his sleeping bag. Luckily, the temperature was only slightly below freezing, and so Kevin had covered his sleeping bag with a bivvy sack, zipped it up, and planned to deal with everything in the morning. Since I had no bivvy sack, my Plan B was to wrap up in the tent fabric like a human tamale and wait out the night. Then I saw a head lamp moving over in another direction. Another tent was down. It was Eric's, and he had room, so I traded help in re-rigging his small tipi for shelter space. By shoveling snow around the edges, we cut down on the ground blizzards that were moving through the tent. 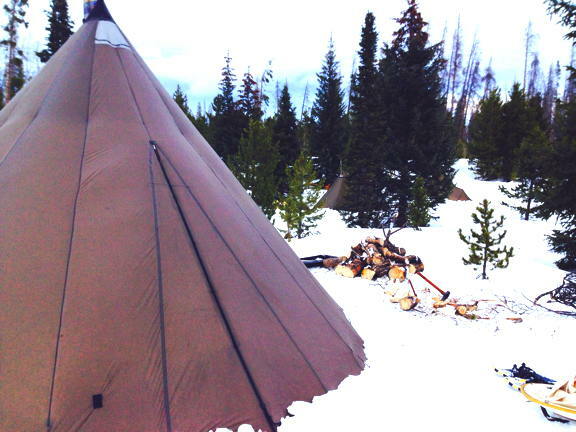 Kifaru's tipis should have stood up to that wind, and in fact, not every one of them went down. For the big tent — maybe the others too – I blame the fact that it was erected late in the afternoon, and the snow had not really set up around the long snow pins. We re-did it the next morning, making everything extra-taut and weighting down the edges with snow, and it did fine. Eric cooking in the snow cave's vestibule. But Eric had another idea: he had started a snow cave the day before, and on Saturday we spent another hour enlarging it to two-man capacity. Snow caves are so quiet. You can hear yourself blink.